One of the biggest advantages of our community partner program is that we get to hear from people across the province. BC is big and diverse and what works for a city of 100,000 people two hours from Seattle might not work for a community of 5,000 people two hours from Whitehorse. That’s a sentiment our community partners often, rightly, remind us of. Last year we decided to try something different; we developed a comic book (and video) called Clear Skies. It was a new approach for us, one that focused on using a story to explain the law. We hoped that as readers learned about Marnie and her kids and how they dealt with family violence, readers would also learn about the law. This approach resonated with a lot of people, including Elizabeth, a literacy outreach worker and our community partner in Haida Gwaii. (Credit where credit is due: Elizabeth told us we should make comic books a while before we actually did.) When Clear Skies came out, Elizabeth went above and beyond. One of the reasons Clear Skies resonates with people is because it tells a story they recognize. Elizabeth used that as a springboard, hosting a discussion group where people gathered to watch Clear Skies and talk about how it reflected their experiences. On a beautiful sunny evening, a group of 18 people (including educators, victim services workers, and people who help children who have witnessed abuse) sat down for a frank discussion about abuse. The feedback from the session was great. People thought that the comic accurately represented family violence and humanized an intimidating process. That’s great to hear and what we were aiming for. What’s more important, though, is that we got to hear this feedback. An opportunity like this is hard for us to organize from our Vancouver office; even if we could get the same people to come out, we wouldn’t have the same rapport as someone from the community. That personal connection really makes a difference. Thank you to Elizabeth for taking the initiative and setting this up. We hope we’ll have the opportunity to help with more sessions like this in the future. The following post is from Amy, our community partner in Nelson. Community partners provide legal information and help connect people to legal services. They can be found all across BC. In a highly publicized trial in Nelson, BC, Sneezy the Wolf was found guilty of mischief for destroying the houses of the three little pigs. The mock trial, written and performed by local students, was just one of the many highlights of Nelson's Law Day this year. Held at the local courthouse, Law Day provided an opportunity for members of the public to tour the courthouse, library, and jail cells; get their mugshot taken; participate in a bail hearing; and learn about other aspects of the justice system. The Advocacy Centre, a community partner of the Legal Services Society (LSS), was invited to have an information table. It was an excellent opportunity to highlight some of LSS’ resources. Young people were invited to participate in a scavenger hunt to find the answers to a series of questions. The question for our table was "Who does Legal Services Society help?" It was a great opportunity to share information about the free legal help available through LSS. Other tables included displays about criminal identification techniques, electronic monitoring, and victim services. This was the first Law Day in Nelson. The turnout was terrific, and we look forward to participating in the second annual Law Day next year. LSS has a network of community partners throughout BC. 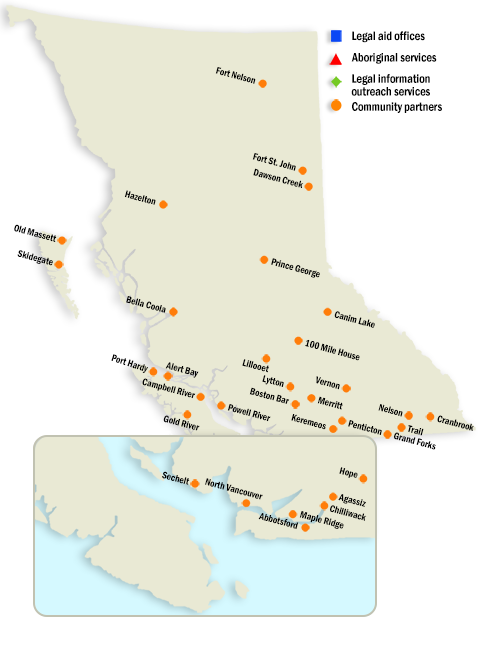 Our community partners stretch from Fort Nelson in the north down to Abbotsford in the south, and from Haida Gwaii in the west to Cranbrook in the east. North to south, the drive is 19 hours according to Google Maps, and east to west, the trip takes about 28 hours by car and ferry. In 2011, LSS began offering “micro-contracts” to existing organizations such as women’s centres and Aboriginal organizations. These contracts allowed these organizations to supplement their services by providing legal information, referrals, and support. Community Partners don’t take legal aid applications, but they help people with their applications – helping them get their supporting documents together and often sitting with them and helping them during their application to the call centre. The program has grown to 27 partnerships across 35 communities that range in size from just a few hundred people to tens of thousands. Last year, we added seven new community partners that are providing services in 13 new locations. 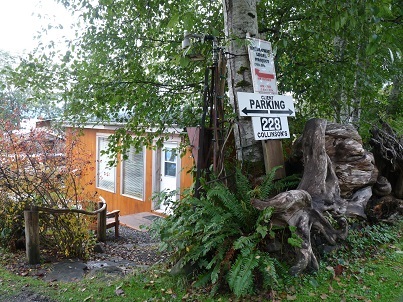 Our partner in Chilliwack travels to Hope once a month to help clients in the area. She has two spaces that she uses in Hope. One of these spaces is a housing project. This project is supported housing for people who are chronically homeless or at risk of being homeless. It’s about a 30-minute walk to downtown Hope and some clients have difficulty getting in to town to receive services, so she goes to them. Many of the residents have issues with drugs or alcohol or mental health issues and get themselves into difficulties with the law. Not only that, but they have trust issues with anyone in a position of authority. Through our community partner’s work, the people at the project have learned how they can access legal help. When she visits now, they call her the “Legal Lady” and come to her with their problems, asking where they should go or who they should call. This partnership has allowed us to reach clients we couldn’t before. These clients can access and navigate the system more easily and they now know of someone to come to if they have any questions.